WINNIPEG – September MLS® sales activity and the year-to-date pace is indicative of a steady market. It is tracking very closely to 2014 as was forecast. 2014 saw WinnipegREALTORS®’ 5th highest MLS® sales result in its 112-year history. If we even use the third quarter or the past 3 months as an example, and look back over 3 years including 2015, it is quite remarkable how similar they are. Some may say nearly identical as there is a difference of only 7 sales between the highest and lowest sales results. In order of highest third quarter MLS® sales to lowest they are as follows: 2013 – 3,803; 2014 – 3,802; 2015 – 3,796. You would be hard pressed to find such a minimal sales difference in any other major Canadian real estate market. 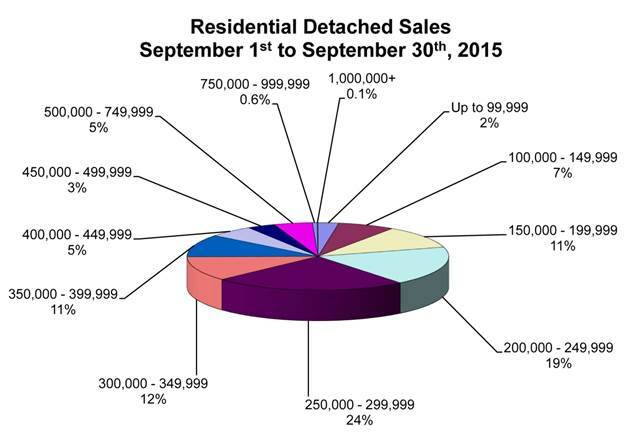 September MLS® sales of 1,144 were off 3% from September 2014. However, they are over 2% higher from the 10-year September average. There has only been one September when sales climbed over 1,200. Despite sales being down 3% from September 2014, dollar volume of $307 million eclipsed last year’s level of $305 million and is the highest MLS® dollar volume on record for September. Year-to-date dollar volume is now over $2.8 billion, up 2% from 2014. 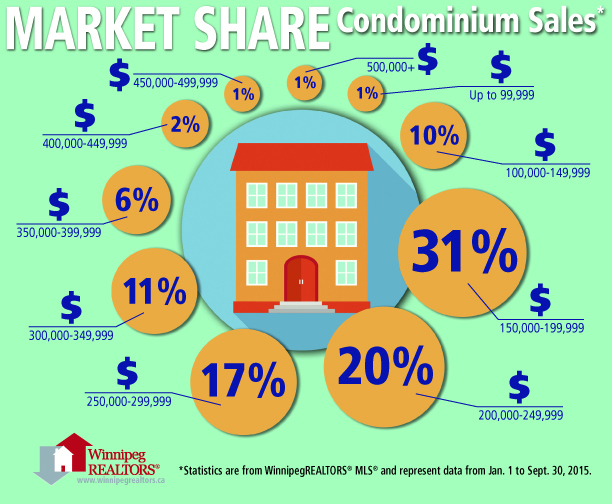 At 10,298 sales, year-to- date sales are in a virtual deadlock with 2014 as a mere 20 more sales have been processed through WinnipegREALTORS® MLS® in 2015 when compared to the same period in 2014. More activity has emerged in the last few years with listings. Winnipeg is in a far more balanced market with 5,538 MLS® listings available at the end of September. This equates to roughly 5 months of supply if no new listings were to come onto the market. Single family homes represent the most at 3,110 while condominiums are well back at 860. There are another 708 vacant land listings. The most active price range in September for residential-detached sales was $250,000-$299,999 (24% of sales), followed by the $200,000-$249,999 (19%) and $300,000-$349,999 (12%). Average days on market for residential-detached sales was 35 days, 2 days slower than September 2014. The highest priced residential-detached sale was $1,150,000. The least expensive sale was $39,500. The busiest condo price range was $150,000-$199,999 (30% of sales), followed by the $200,000 to $249,999 (22%) and $250,000- $299,999 (16%). Average days on market for condominium sales was 56 days, 16 days slower than September 2014. The highest-priced condo sale was $482,500 and the lowest-priced sale was $72,500.